Trial Bay Gaol, South West Rocks, Australia. 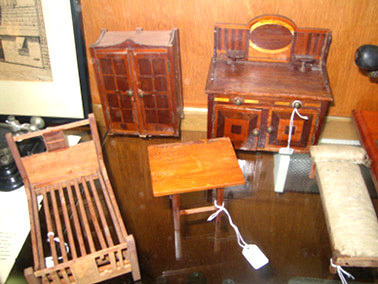 The miniature dolls furniture are made from cigar boxes that consist of thin plywood. The various items are made from wood, linen, steel and glue. The outbreak of fighting in Europe in August 1914 immediately brought Australia into the Great War. Within one week of the declaration of war all German subjects in Australia were declared ‘enemy aliens’ and were required to report and notify the Government of their address. In February 1915 enemy aliens were interned either voluntarily or on an enforced basis. In New South Wales the principal place of internment was the Holsworthy Military Camp where between 4,000 and 5,000 men were detained. Women and children of German and Austrian descent detained by the British in Asia were interned at Bourke and later Molonglo near Canberra. Former jails were also used. Men were interned at Berrima gaol (constructed 1840s) and Trial Bay gaol (constructed 1889). The internees at Trial Bay Gaol created their own management committees that organised entertainment, sport, culture and arts activities. The miniature dolls furniture was made by an internee attached to an art club at the camp. The miniature dolls furniture are a part of a wider collection of objects used by the internees that are integral to the fabric of the Trial Bay Gaol heritage site and provides the distinctive character of the place. Its primary significance lies in its relationship to the themes of wartime internment experience, racial antagonism & fear of subversion and Australia’s links to and following of Britain’s wartime foreign policies after Federation. The Collection interprets the story and provides evidence of the experience of the German internee’s life at Trial Bay, the attitudes of the German internees to the war and internment and their relationships to other German communities in New South Wales both interred and free. The camp newspaper Welt am Montag produced by the internees gave a running commentary of politics, the local German perspective on the progress of the war and an insight to the conditions and grievances of life at the camp. The miniature dolls furniture made by the internees made reflect the strong sense of community, boredom & hobbies and activities to fill in time and a longing for families and children symbolised by living care invested in the children’s toys made for Christmas presents. The miniature dolls furniture are historically significant as evidence of the experience of the German internee’s life at Berrima Gaol during World War I. The models and toys are evidence of a cultural tradition that has migrated with the German migrant communities Australia since the 1840s. The miniature dolls furniture has aesthetic significance in the design and manufacture of toys for children interred at other internment camps. The internees were educated and cultured. The design and manufacture of the miniature dolls furniture reflects the influence of German artistic and intellectual traditions, and a strong sense of patriotism. The miniature dolls furniture provides a research tool for historians to explore the First World War chapter of Australian history and give the story a wider meaning in the context of the History of migration & settlement of Australia. The material culture of the Trial Bay Collection reveals of the diverse skills and backgrounds of the people interned there, including their educational and cultural background. Members of the Trial Bay internee community included wealthy industrialists, doctors, academics, publishers, professionals and entrepreneurs from Australia and South East Asia as well as Australian guards and Soldiers. There is substantial intangible significance in the dolls furniture as material culture associated with internment. Internees and guards families have a common link to the place and many local residents have developed a strong attachment to the place. Many local residents are collectors and amateur historians carrying out many years of research and documenting the history of the site and the Collection. A lot of information still resides in the memories of the South West Rocks community. The place is a focal point for both Australians of Germans decent and visiting German nationals. The miniature dolls furniture are a part of a collection that has strong links to the community. It is part of a group of objects that holds pride of place in the Trial Bay Museum as an inherently German object from World War I. The miniature dolls furniture provenance is well documented from 1918 to the present. The internees made the miniature dolls furniture for children’s toys for Christmas presents. 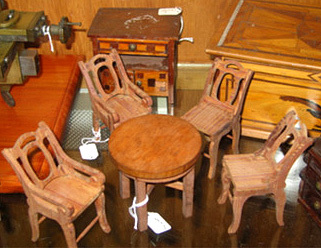 The miniature dolls furniture were given to Sergeant George Harrison, Quarter Master; Sgt of the Guard by the internees. The miniature dolls furniture were donated by the Mr Harrison in the late 1970s. The miniature dolls furniture are rare in that it relates specifically to the German internee occupation of the site and it is associated with those particular people who emerge as significant participants at the Trial Bay Camp and World War I Australian internment camp history. These people include the camp artists Max Hertz, who was also a distinguished orthopedic surgeon, Kurt Viese, who went onto become head of Animation for Disney Animation and E. Frolich a prominent collector of the work of the Trial Bay internee photographers. Frolich donated a considerable collection of Trial Bay photographs to the Australian War Memorial. The objects represent the culture and traditions of the German internees. It bears similarities with the children’s toy made by of the internees of the Berrima internment camp. This object shows a strong eye for accuracy and detail and represents a symbol of German internee’s patriotism and defiance as prisoners. The miniature dolls furniture, as part of a larger collection represents Australia’s strong historic links to Britain and the adherence to British foreign policy after Federation. The Collection represents Australia’s fear of subversion during the war and racial antagonism to cultural minorities in war time. The Collection represents a time when Australia still looked to Britain for foreign policy and held deep suspicions of non British immigrants. This is evidenced in the concentration camp nature of the internment, the isolation of the place, the boredom that resulted in the detailed and precise & immaculate children’s toy furniture. The importance of the miniature dolls furniture lies their potential to interpret the place a site associated to internment, the internment camp itself and the experience of German communities. The Collection presents the opportunity to interpret the stories of various individuals who were interred at Trial Bay and those who were deported after the War only to return as migrants and become successful members of the Australian community despite their experiences. Davies, P 2000, Trial Bay Gaol Conservation Management & Cultural Tourism Plan, Dept Environment & Conservation. Fischer, G W & Helmi, N 2004, Internment at Trial Bay during World War I, unpublished thematic history, Migration Heritage Centre & Dept Environment & Conservation. Fischer, G W 1996, Enemy Aliens, Queensland University Press.